I continue to poke fitfully at cameras. Maybe I should just dig out one of the old film cameras for a while, just to tide me over. In the category of "great joy" the new computer is so lovely to use I keep drawing pictures instead of doing the administrative tasks that need doing, Jeremy, now, Jeremy. However, it is not without its wrinkles. In the category of "massive annoyance" my (legitimate HUP copy) of Adobe suite has run an update and reverted to a trial version and now keeps spitting out my number, claiming it is not legitimate. Apparently I am not the only one™ but that doesn't make it any easier to bear. The tomatoes are now in full flow, finally, but the drought is beginning to show on the trees along the river and the flowers in the garden (of which there are few; not enough rain). The stairs carpet is booked in. We're hoping that it'll make it easier for Teasel cat to negotiate the stairs (he's very tottery at the moment). At work, they've shuffled our desks in the run up to the next round of cuts. I've been left at mine, but you could interpret that in (at least) two ways. 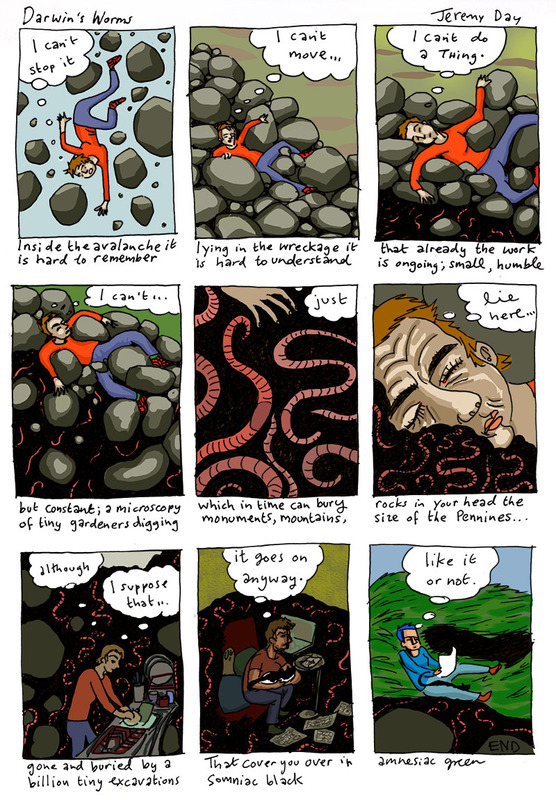 And so to this week's strip, Darwin's Worms. The title refers to one of Darwin's famous experiments (not the one with ducks' feet) where he placed rocks of varying sizes in a meadow behind his house, and measured how long it took for the rocks to be buried by the normal activity of worms. 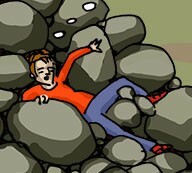 As I recall, the experiment was a long one, but in the end every single rock sunk under the soil. Click pic for full strip. Little worms raising you up slowly slowly. A wormatron! I could do with one of those! Cool strip: lovin' the colours.